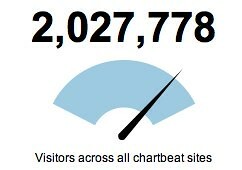 After chartbeat launched in April 2009 it took us 16 months to get to the point where we were recording the digital heartbeat of more than one million people at any one time. I’m psyched to be able to say that just five months later we have hit two million simultaneous visitors. That’s not two million in the course of a day or an hour, that’s two million people concurrently at a single moment in time. Thank you to all our incredible partners who’ve helped us get here, had the courage to try something radically new and given us so much advice and guidance; we wouldn’t be here without you. Hey Publishers, Chartbeat is getting personal! We’re proud to announce that the alpha release of Newsbeat, the first analytics service built entirely for Publishers. Newsbeat is real-time analytics purely focused on what’s important for those people creating and editing content on the front lines of media sites. Every editor and writer can have their own dashboard showing them what’s happening on their content, and how to improve its performance to maximise traffic and engagement. We’re opening up early Alpha access to a select few so if you’re a Publisher, Editor or Writer who wants to find out more, go to Newsbeat and see just what it can do for you.